Who is this Andy Deas you ask? Andy Deas and Robb Wolf from Norcal Strength & Conditioning fame are the hosts of The Paleo(lithic) Solution podcast. This weekly podcast is a veritable cornucopia of Paleo Nutrition and Sports & Conditioning goodness. I can’t recommend it highly enough. As of a couple of weeks now, Robb Wolf is also a New York Times bestselling author of The Paleo Solution: The Original Human Diet. We recently received our copy of this awesome book and will be providing a more detailed review in a future post. If you are newcomer, or considering this Paleo lifestyle, this book is a must read! It will change your life! 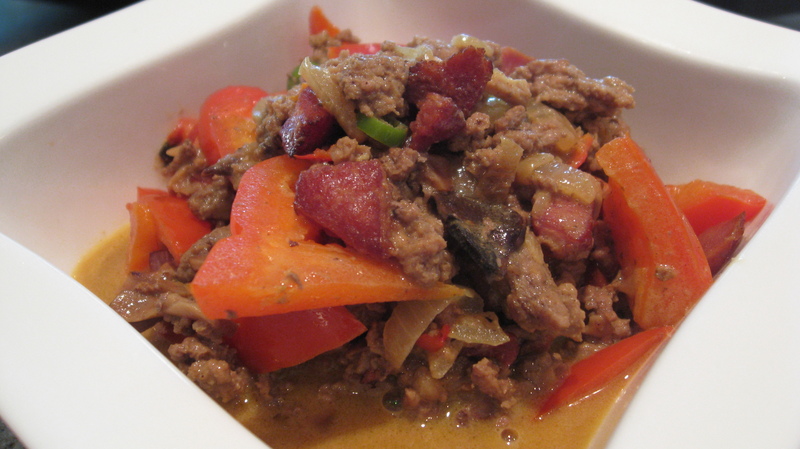 We stole and then modified this recipe from the Norcal Strength & Conditioning site. Thank you Andy Deas for the idea and Katie for perfecting and posting it! This has become one of our favorite breakfasts and a nice change from the 7 minute perfect breakfast bacon and eggs we recently posted about. 1a. If making with sausage heat coconut oil on medium high heat and add sausage and onions. You want the sausage to get a bit firm so you can remove it and dice into smaller slices. 1b. If using pork belly or bacon, cook either on medium high heat until you render some of the fat then add onions and cook until onions are brown and glossy. 2. Add beef, sliced sausage, spices, garlic, and peppers (or other veggies) and cook for another 5-8 minutes on medium high heat. Next add mushrooms and cook until tender. Add the coconut milk and simmer (medium-low) for another 5-10 minutes or until desired consistency. 3. Garnish with some fresh squeezed lime in lieu of salt. Enjoy, and if you come up with some nice variations please post them in the comments for others to try!